occasionally making a comment or three. Saw something today that made me want to blog again. I'll get to that at the end of this post. I promise. Just haven't felt I had anything 'blog worthy' to say lately. So here goes, and if blogger cooperates I will publish this tid-bit. Just a simpler way of life. Therefore; the view can change as often as you can turn the ignition and put it in gear. Change neighbors as often as ya change yer clothes (if you like). The reasons, after all, are endless to say the least. Make your own list and YOU decide what it is YOU want to do. It makes it a bit more difficult to have regular visits to your FAVORITE physician. Ya might have to plan trips back to 'a home base' on a quarterly or semi-annual time frame. Ya sure can't keep all Aunt Eunice's, G'ma's or G'pa's things you inherited. Give it to a family member or Goodwill etc. Forget having dozens of picture albums. Just put'em on a thumb drive... and view them anytime you like. Usually lots less space for storing FRESH foods or even FROZEN for that matter. So more frequent shopping trips may be in order. No more bulk buying from the local big bin type stores. When a family member (or really good friend) gets sick or worse yet pass away, you can't just go down the road, or across town to visit. However; this would allso be true if you you lived in a SB house in a different state from family. And this is the case with lots of people. I saw an article this morning that caused alarm ...but not for me...for others...Since my home / house / hotel room is on wheels and can go wherever I choose to take it (generally speaking of course). This would not actually concern me personally. However; others might and probably should be concerned. Ya know it is one thing to go into a hotel room and find they have ...eeek! BED BUGS... or Roaches, ants etc. You get my drift, I'm sure. Take care and GOD BLESS YOU, ONE AND ALL. Would like to 'monotize' this blog ... every lil penny would help, ya know..
To whom should we issue payment? Note: Residents of Arkansas, Colorado, Connecticut, Illinois, North Carolina or Rhode Island are not eligible to participate in the Associates program. ... as always, comments / suggestions sure are welcome. Monday and an update to "Stormy Paths"
It , errra. the a/c is doing better. For clarification let me say it has cooled wonderfully... it is the water leaking onto the bed that has been the problem. Well, the other night after I had posted about the situation, our friend (formerly workkamper) from within the campground came over to take a look. Note he doesn't live/work here any longer, but that's another story. Anyway, a trip onto the roof, into the bedroom, back to the roof, back to the bedroom ... well ya get the picture, right. He ran a compressor hose in through the window, blew out the coils, vaccumed etc. etc. During all of this, he removed the a/c shroud...cleaned out the drain lines, checked this and that... heck don't ask me... I'm not going up there...I can't ... I'm too old for that climb. It seemed to work just fine, we felt like the last remaining water that had worked into the a/c interior was just gonna take a few more minutes to blow itself out.... well not exactly. I'm now pretty sure we are gonna have to replace the 14 x 14 gasket that seals the a/c and roof....now if that doesn't do it .... I'm at a total loss. So on the search for that gasket, order it... get it here and get our wonderful 'jack-of-all-trades' ... to put it in. X'ing fingers, praying and praying some more that it will solve the problem once and for all. Laugh if you will, I don't care... it is working and my bed is DRY!!! I am so thrilled for each of you living your RV dreams. Whether you bought NEW or got a great Used deal...Hoooorah! for you! Thrilled when a Sun shinny Path is being experienced by anyone. Found it only a few miles from where we were, so that part was great. Took an afternoon, went and looked it over. Even took a 'mechanical friend' with us to give us an unbiased opinion. The price was right (for the make/model) so we bought it. 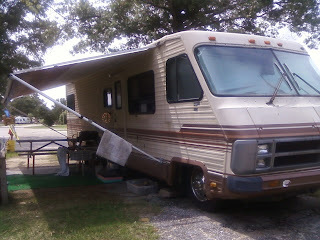 Now thing is we ARE living in it from the day we brought it to the campground. Fridge works, however; would like it to work on elec. and it won't ..capable, but for unknown reason it refuses to switch to elec. when the propane is turned off..or runs out. Two a/c units... great, but can only run one at the time (30 amp thing) ..unless we use the gen... but of course gen use is not allowed in campground. This is our 'storm' ...will get to that lil later. Stove, micro, water heater (gas only) all work just fine. NuWave cook top... love it , works awesome and without heating up the RV. crunched up against a wall. Especially when it comes to changing the sheets. We would have liked to remove the booth and put in chairs instead, but underneath the seats ... is location of the gas heat units (2) ... one under each seat. So that sort of kicked that idea in the head. Real good is roof in great shape, and was only one window which leaked when it came really hard rain.... got that re-sealed , so good to go there. 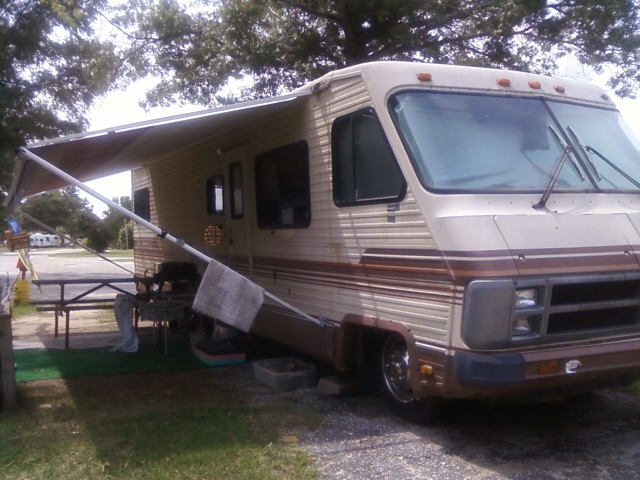 The awning is also in great shape, obviously not original to the RV. 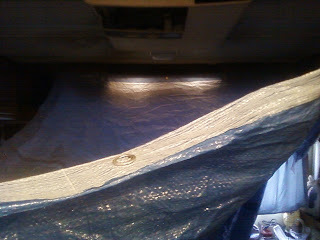 Plus we did get it secured on each end with straps and anchors...and sufficient enough tilt so that rain doesn't pool. WHY oh WHY do / did they put a roof mount A/C ... OVER THE BED??? We did not realize that the a/c unit over the bed would cause such a situation? problem? Call it what ya want. It is quite a problem, currently for us anyway. #1 It needs cleaning and filter changing. I am just not steady enough on my feet. And well...Joe definitely has problem when it comes to height, ladders etc. We both may well be too heavy for the roof, not sure , but don't want to find out the hard way either. This has resulted in the condensation LEAKING thru the unit...and of course right ONTO the BED. I have used 'doggie pads' to catch it, towels, and even large bowl. But ya can't SLEEP on the BED with all this going on. So, opened up the sofa, and we both slept there last night, and was comfortable enough... definitely DRY. and get the dang thing serviced. been able to catch here in a photo. I promise I did NOT pose her. 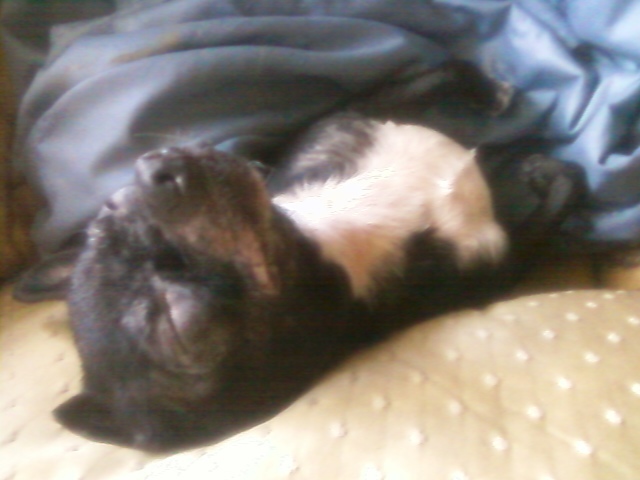 She loves sleeping on her back..
with her front paws out and over the covers. Here she is on the sofa pillow and worked her way underneath the quilt... oh I should photograph and tell that story (another post for sure). Can ya tell.... 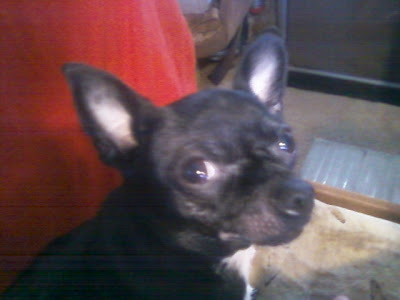 I LOVE MY LIL EBONY!! I feel I must or should apologize...for having abandoned my blog for a full WEEK! with the heat ... but mostly due to my back being 'less than up to par'. takes quite a bit of time out of the day. To say the least, right. this past week, mostly due to my back acting up from time to time during this week. but I am refusing to let it do me in. without spreading my mood about to your blog. That said, I am trying to improve my mood. It is all about attitude, and mine needs work right now. any obstacle placed between us and our dreams. the rare shot that we get..
but I'm gonna post anyway. Later, all... will try to get some good pics or content for later in the day... or for tomorrow for sure.